End User Agreement*: I am 21 years or older & am aware that NFA rules apply to this upper. 1/2 x 28 thread pitch (Only use muzzle attachments made for 9mm 1/2 x 28). 8620 steel nitrided 9mm bolt. Ramped for compatibility with standard AR15 hammers. Compatible with Colt 9mm or Glock small frame magazines. Alpha Premium 9mm Nitride BCG with forward assist serrations available as an upgrade. 100% U.S. made parts with a limited life time warranty. Please allow 3-8 business days for your order to be processed. Shipped insured, with adult signature required upon delivery. All NFA rules apply. Check your local laws before purchasing this item. 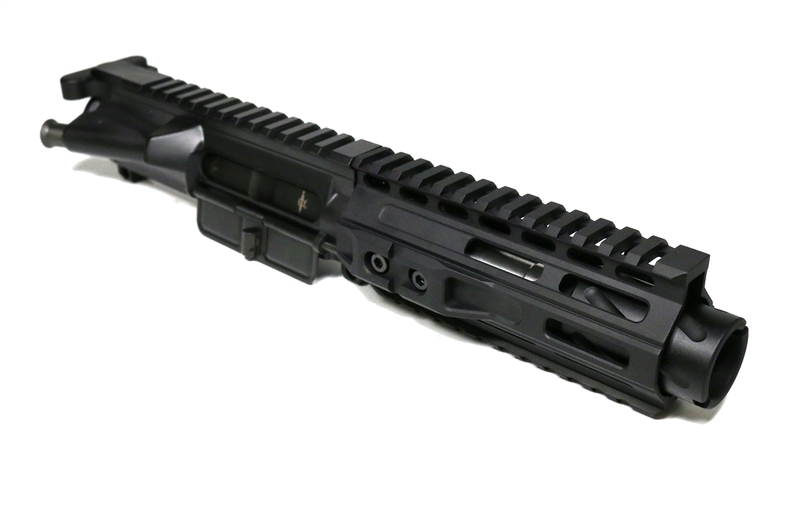 This upper has a barrel shorter than 16". Alpha Shooting Sports will not be responsible for misuse of this upper. Legal for use on properly registered AR pistols.